K8 knockout mice develop an early and chronic Th2 type of colonic inflammation, amendable to antibiotic treatment resembling human ulcerative colitis. We are interested in understanding how keratins in intestinal cells maintain homeostasis with focus on colonocyte energy metabolism, proliferation, differentiation, ion transport, hypoxia, stress protection and protein targeting. We study keratin function in vivo using the K8-null and K8-null heterozygous null mice, and intestinal diseases are modeled using e.g. 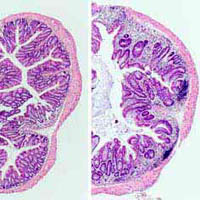 DSS (chemical model of colitis) and AOM (model for colorectal cancer), and using novel non-invasive in vivo intestinal image analysis techniques detecting reactive oxygen species. Mechanistic questions are also addressed using intestinal epithelial cell culture models (e.g. siRNA, virus, Crisper/Cas9 and organoid culture technology), as well as multiple high resolution imaging techniques. Numerous human diseases are associated with keratin mutations, however both the function of keratins in the endocrine pancreas as well as their potential role in diabetes is as yet uninvestigated. Keratins 8 and 18 are the main intermediate filament proteins in the islets of Langerhans, and our studies focus on investigating their involvement in the regulation of islet physiology and regulation of blood glucose. The studies focus on GLUT2, mitochondrial health and vesicle dynamics. 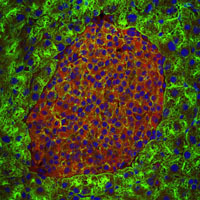 Main models used are keratin-deficient mice, NOD – modeling type I diabetes and the beta-cell toxin streptozotocin as a chemical diabetes model. Mechanistic questions are studied in entire isolated islets of Langerhans, primary beta-cell cultures and in insulinoma cells in culture.